"Astroworld" redirects here. For the Travis Scott album named after the park, see Astroworld (album). Six Flags AstroWorld (or more commonly AstroWorld) was a seasonally operated theme park located on approximately 57 acres (23 ha) of land, later expanded to over 75 acres (30 ha), between Kirby Drive and Fannin Avenue, directly south of Loop 610 in Houston, Texas. The park opened on June 1, 1968, and was originally developed and constructed as part of the Astrodomain, the brainchild of local philanthropist and former Houston mayor Judge Roy Hofheinz, who intended it to complement The Astrodome. AstroWorld was sold to the Six Flags Corporation by the Hofheinz family in 1975. Although the fourth park to be included in the Six Flags family of theme parks, it was the first park to be purchased by that company instead of being built. It was marketed as "AstroWorld: A Member of the Six Flags Family" so as to not confuse patrons with Six Flags Over Texas located in Arlington. Many variations of this naming scheme emerged from the Six Flags marketing department over the years. Despite these attempts at branding the park, most people continued to call it "AstroWorld" and the company eventually responded by making the individual park's name more prominent. Similarly, Fiesta Texas in San Antonio has been marketed as "Fiesta Texas: A Six Flags Theme Park". AstroWorld was permanently closed by the Six Flags Corporation after its final day of operations on October 30, 2005. It was demolished between October 30, 2005 and the first half of 2006 (although parts of WaterWorld were being demolished prior to the final operating day at AstroWorld). The bridge crossing Loop 610 from the park to the parking lot continues to stand and is the last remaining structure from AstroWorld. The area where AstroWorld once stood is still grassland and is used for overflow parking during the Houston Livestock Show and Rodeo. AstroWorld was the home of many unique attractions. It also developed or debuted several prototype ride concepts including the world's first river rapids ride (Thunder River, 1980), the first successful Arrow suspended-swinging coaster (XLR-8, 1984), one of the first Arrow mine train coasters to utilize tall steel column supports (Dexter Frebish Electric Roller Ride, 1972 and was later renamed Excalibur when the former County Fair section was rethemed Nottingham, 1980), and the first S&S Power sky-swatter ride (SWAT, 2003). The Alpine Sleigh Ride was a dark ride attraction which opened during the park's first season. It had a ride control system and vehicles (ArrowGlide) designed by Arrow Development. Riders passed through an alpine forest before reaching the show building which was designed to resemble a large mountain capped with snow. A waterfall cascaded from atop the mountain and down into a catch pond near the mountain's base. Once past the waterfall, riders would journey through many chambers within the mountain. These included an echo tunnel and an avalanche room with simulated snow. At several points throughout the ride, the vehicles would exit and travel along the exterior of the mountain-themed show building. The sleigh-themed vehicles were powered by an electrical bus bar where portions of the track ascended, and they were gravity powered during the descents which featured several surprise dips. Part of the show building was shared with the adjacent gas powered car ride (Le Taxi) which passed through a tunnel in the side of the mountain. The ride included an appearance by the "Abominable Snowman". Alpine Sleigh Ride was retired after the 1983 operating season. Greezed Lightnin', a classic shuttle roller coaster designed by Anton Schwarzkopf which accelerated riders from 0 - 60 mph (97 km/h) in roughly 4 seconds was installed in 1978. Riders traveled both forwards and backwards during the course of the ride over a non-linear track with one loop and a braking hill on both ends. Greezed Lightnin's 1 millionth ride occurred on October 15, 2005. The Ultra Twister, a TOGO pipeline shuttle coaster featuring three heartline twists, opened in 1990 and was the only ride of its kind operating in the United States. Originally featuring a 90-degree vertical lift, a new 45-degree lift hill was constructed for the ride when it was moved to Houston from Six Flags Great Adventure. Exterior sections of the Alpine Sleigh Ride (which had not been in operation for several years) were demolished to make room for the Ultra Twister and its queue house. The park's original layout was created by Hollywood designer and architect, Randall Duell. The park name, as well as the names of The Astrodome, the Astros baseball team, and all other Astrodomain properties, were a homage to the nation's manned space programs after Houston was selected to be the home of the Johnson Space Center in 1965. AstroWorld was constructed on land that was swampy and prone to flooding. A million cubic yards (765,000 m³) of dirt were used to fill the site in preparation for construction. Some areas of the site were filled to depths as great as six feet (1.8 m). Ahead of its time, a unique feature of the park's infrastructure included 2,400 tons (8,400 kW) of outdoor air conditioning powered by systems built by Carrier Corporation. Underground pipes carrying chilled water radiated out to most areas of the park and provided cool air to queue lines, picnic tables, shops, restaurants and other large open spaces. Air conditioning ducts and grates were disguised and blended to match the area's theming. High standards were set by Judge Hofheinz. Mr. Hofheinz had final approval for aspects of park design. Many rare and valuable antiques, some from Mr. Hofheinz's personal collection, were used to enhance the theming in areas. The original landscaping, all designed in-house, included approximately 10,000 trees, 20,000 shrubs, and countless millions of flowers; nearly 600 varieties of plants were all combined to create a distinct atmosphere for each of the themed areas. The bridge crossing Loop 610 which connected AstroWorld to its share of the Astrodomain (now NRG Park) parking lot was the only publicly accessible, privately owned bridge to cross an interstate highway in Harris County, Texas. A monorail system connecting Astrodomain properties was planned but never built. Stan McIlvaine of the Houston Sports Association (of which Roy Hofheinz was president) had contacted Walt Disney's MAPO, Inc. division concerning the plan as early as 1966. The beamway would have connected AstroWorld's Entry Plaza with the parking lot, the Astrodome, the AstroWorld Hotel, and possibly other nearby locations. The bridge over Loop 610 was engineered and built so that it could accommodate the planned monorail beamway. Bridge supports extended extra feet on both sides. Tram vehicles were employed to shuttle guests between the Entry Plaza and parking lot after the monorail plan was abandoned. Western Junction: Crystal Palace Theater (showplace with country western revues), Mill Pond (bumper boats), Shooting Gallery (electronic shooting gallery with cowboys, bartenders and saloon girls), Wagon Wheel (Chance trabant). Two new attractions were added to Oriental Corner in 1969: Bamboo Shoot (Arrow Dynamics log-flume ride) and Serpent (Arrow Dynamics junior steel coaster). An eighth themed area, Fun Island, is opened in 1970. Located in the lagoon between Oriental Corner and European Village, this tiny area featured the Wacky Shack (tilted illusion house) and Swamp Buggy Ride (themed Chance toboggan ride). Other changes included renaming The Happening (scrambler) to The Orbiter which was then enclosed within a domed structure. Modville received two additions in 1971: the Barrel of Fun (rotor ride) and the "Mod Box", a contemporary-themed gift shop. Country Fair opened in 1972 as the park's ninth themed area. The Dexter Frebish Electric Roller Ride opened as the main attraction of this new area and is the first attraction to be constructed outside the perimeter of the 610 Limited railroad tracks. Designed by Arrow Development, the large steel coaster featured mine-train style rolling stock and was one of the first Arrow mine train coaster to utilize tall steel support columns. Opryland USA's Timber Topper opened the same year with similar support columns. The Swamp Buggy ride (Chance toboggan) was removed in 1973. A performance stage was constructed at the base of Skyrama (Astroneedle) in 1974. AstroWorld was leased to the Six Flags family of theme parks in 1975 with an option to purchase. They took advantage of that option before the 1976 season. The Mill Pond boats were removed, the pool was partially filled and Gunslinger (Chance Yo-Yo) was installed on that site. The Coney Island section of AstroWorld opened in 1976. In the mid-1970s, the management at AstroWorld wanted to build a classic wooden coaster as the key attraction for a new Coney Island themed area and initially considered relocating the world-famous Coney Island Cyclone to Houston before settling on building their own faster, taller, mirror-image version. When completed, the Texas Cyclone was one of the largest wooden roller coasters in the United States. Featuring a 92-foot (28 m) lift and a 53-degree angled drop, it reached speeds of up to 60 mph (97 km/h). It had over a dozen drops and was one of few full-sized roller coasters in the world to operate without a mid-course brake run. More than 25,000 gallons of red, white and blue paint were used to cover the Douglas Fir lumber used for construction. At one time, it was rated the world's #1 roller coaster. During construction of the Texas Cyclone, a tropical storm destroyed the entire north end turnaround section (as seen in the film Brewster McCloud) causing it to have to be rebuilt and the opening pushed back to June 12, 1976. In 2001 it was determined that modifications made to the ride rendered the head-rests unnecessary and they were removed enabling riders a greater view during the course of the ride. The original trains featured a "Texas Flag" paint scheme. Three sets of trains were used on this ride over the years. A small section of trackage was cut away from the ride prior to demolition. It will be preserved for posterity and displayed in a museum. Modville was renamed International Plaza at the beginning of the 1977 season. The Aquarena Theatre was constructed between Plaza de Fiesta and Western Junction. It featured performances by trained dolphins, Skipper and Dolly. Country Fair received the addition of Boogie Fog Disco, but the Country Fair Carousel was removed. Greezed Lightnin' was installed in Western Junction for the 1978 operating season. A railroad crossing signal was installed and this became the second attraction to be constructed outside the perimeter of the 610 Limited railroad tracks. The Showcase Lagoon grandstands were constructed and stunt ski performances began in 1979. These shows included formation skiing as well as high speed jumps off a large ramp. Guests standing near the front rows of the grandstand were often splashed by the wake of the ski boat as it made high speed turns around the small lagoon. At this point in time, the Showcase Lagoon and the east lagoon (also referred to as Oriental Lagoon) were still one large body of water. The ski boat would often use the east lagoon for turning around after a run. A clown skiing on a round piece of plywood (called a saucer) while entertaining the crowd was also part of the show. The decade began with an exciting start as the park continued to expand its entertainment offerings and add new ride attractions. 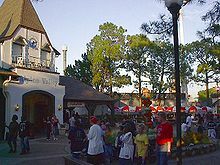 The 10-acre (40,000 m2) whitewater adventure, Thunder River, was opened in the northeast corner of the park, planning and construction of Houston's first water park began, two music and live performance venues were constructed, and a catering and special events pavilion known as The Big Red Barn was constructed in the southwest corner of the park. From 1986 to 1990 Astroworld had a dance club on the property called "Studio A". This club was the location for a local television Music Video & Dance Show called "Videocity" which aired on KPRC 2. It was hosted by local DJ Bob King of 93Q KKBQ. The Southern Star Amphitheatre opened in the southeast corner of AstroWorld in 1980. This venue was frequented by performers including Jimmy Buffett & the Coral Reefer Band, prior to the construction of The Cynthia Woods Mitchell Pavilion in The Woodlands, at which time Southern Star saw a decline in the number of top-billed acts performing on its stage. Reserved seating was available and a grassy lawn was provided to guests with general admission. The close proximity of Greezed Lightnin's first runout spike to the stage often resulted in that ride being closed during performances to minimize noise. The world's first river rapids ride, Thunder River, debuted in 1980. General manager, Bill Crandall, had been inspired after watching kayak races and set forth to create a unique and thrilling attraction for the park. The ride - featuring free-floating boats along a wild land setting - was extremely successful and has been duplicated in many variations at most major amusement parks around the world. Thunder River was the third attraction to be constructed outside the perimeter of the 610 Limited railroad tracks. Thunder River was temporarily closed following a drowning accident on Six Flags Over Texas' Roaring Rapids attraction, but soon reopened after receiving rapids ride rafts from the defunct Opryland USA theme park in Nashville, Tennessee. Country Fair was renamed and remodeled into Nottingham Village in 1981. The Dexter Frebish Electric Roller Ride was renamed Excalibur and its queue house was re-themed. The AstroWheel was also removed during this time. Sky Screamer, a first-generation Intamin Freefall ride, was constructed in the Plaza de Fiesta section and opened in 1983. Consisting of a tower reaching 131 feet (40 m) in height and a horizontal braking runout, Sky Screamer had an L-shaped appearance. It featured eight uniquely designed gondolas, each holding four riders. The gondolas used one set of wheels to go up the lift and down the drop (4 large wheels at each back corner), but used a different set in the transfer and loading and unloading area of the ride (smaller rollers located on the bottom of the gondola). Gondolas were lifted upward through a shaft in the tower's center by a lift chain. Once at the top, the gondola was disengaged from the lift chain and pushed forward into the drop position. The gondola was released into freefall following the sounding of a loud klaxon (which was audible throughout sections of the park and often lured visitors to the ride). A pair of guide rails ran downward along the outside of the tower before curving into the horizontal braking runout. The freefall drop into the horizontal curve applied a g-force of 4.5 on the riders. In late 1983, 50% more anti-rollback devices were installed. The additional anti-rollbacks were staggered on each side of the lift. These modifications were intended to improve stopping ability in wet conditions and were a response to a non-fatal accident on a similar ride at another park. In 1986, the ride's "G-Block" was moved farther down the horizontal braking runout. The end of "H-Block" was extended to the beginning of the station conveyors in 1994. Sky Screamer was dismantled on November 2, 1997. WaterWorld, Houston's first major water park, was constructed on a section of land east of AstroWorld and opened to the public in June 1983. Admission to the water park was separate for almost 20 years, until it was decided in 2002 to allow admission to both parks with one paid ticket, at which time the entire water park became a themed area of AstroWorld. The park was originally accessible only via the Six Flags Astroworld 3 ft (914 mm) narrow gauge 610 Limited locomotive, but a pedestrian sidewalk was eventually built, allowing guests to walk from the Six Flags Waterworld ticketing area to the park itself, eliminating the need to wait for a train ride. Six Flags Waterworld became a themed section of Six Flags Astroworld in 2002 with a second entrance being built near the "Plaza De Fiesta" section of Six Flags Astroworld; a single ticket granted admission to both parks. Original attractions included Breaker Beach (large wave pool), Squirt Splash (children's play area), speed slides, body slides, lagoon activity area, and an inner-tube chute that wound itself around and over the "Thunder River" river rapids ride. Many items from Six Flags Waterworld were moved to Six Flags Splashtown after the closure and demolition of Six Flags Astroworld. 1984 brought changes to the park. The Children's World section of the park was closed, renamed "Enchanted Kingdom" and relocated to the European Village site formerly occupied by Le Taxi, which itself had been relocated to the former Spin-Out track. The sports cars originally used on the Spin-Out were retired after being displaced by the taxis. Also, a tilt-a-whirl replaced the park's "Whirling Dervish" (flying bobs) although the name was kept. The Arrow Dynamics suspended-swinging coaster, XLR-8, was constructed above the River of No Return boat ride. The river was shortened and several scenes from that ride were eliminated to provide space for XLR-8's queue house. River of No Return became an educational attraction known as The River Ride. Arrow Huss was prepared to follow up on its suspended-swinging coaster concept after the failure of the prototype, The Bat, at Kings Island theme park. The company did this with XLR-8, considered to be the first successful coaster installation of its kind which was intended to be part of a ride rotation program which Six Flags Corporation had implemented during that time, however the ride was never moved from the time it opened on May 12, 1984, until its track and supporting structure were dismantled and scrapped during AstroWorld's demolition. Evidence of the intent to eventually relocate XLR-8 could be seen in the queue house design, which consisted of a basic wooden platform covered by a canvas canopy. This queue house would remain mostly unchanged during the ride's existence, but the path leading up to it was eventually re-routed to improve traffic in that area of the park. XLR-8 featured three trains, each comprising seven cars. This number was reduced to two trains during the late 1980s. The ride featured two lifts, approximately 3,000 feet (910 m) of track, multiple spiral turns and a view of the river ride landscaping below. XLR-8 was capable of cycling approximately 950 riders per hour. The estimated cost of construction was reported to be $3.2 million. Trains completed the course in three minutes, reaching a top speed of 50 feet per second (15 m/s). Lift one reached a height of 81 feet (25 m) while Lift 2 only reached 64 feet (20 m) in height. XLR-8 got a Secondary Control Panel in July 1988. This panel was located on the loading side of the queue house and near the first row loading position. The ride attendant and Master Console Operator had to hold their dispatch buttons simultaneously in order to dispatch a train. This alteration was made in order to enforce a double check between ride attendants and operators. The trains of XLR-8 were upgraded with diaper-like devices in May 1989. These devices hung beneath the trains' wheel assemblies to catch any oil or debris and prevent it from coming into contact with riders. The catwalk at Lift 2 was lengthened in the Spring of 1998 and stairs were added. The Looping Starship opened at International Plaza in 1986, replacing Warp 10. AstroWorld had intended to name the ride "Challenger" as a homage to the Space Shuttle, but decided on Looping Starship after Space Shuttle Challenger was destroyed. The Six Flags Corporation was acquired from Bally by Wesray Capital Corporation and members of Six Flags management for $610 Million in 1987. During this season, the troika ride formerly known as Warp 10 was reopened as Warp 2000 in the Plaza de Fiesta section. The Wacky Shack closed and its building was renovated to become the park's season pass processing station for several years. Six Flags AstroWorld originated the Fright Nights special event for the Halloween season in 1986, designed to help drive attendance during the otherwise light fall season. The event was renamed Fright Fest in 1993, and it continued until the park closed in 2005. The Six Flags chain of theme parks was purchased by Time Warner over a period of four years beginning in 1990. During the 1990s, AstroWorld introduced several new attractions including Batman The Escape (which was once the only stand-up roller coaster in the state of Texas), the TOGO Ultra Twister (a pipeline shuttle coaster featuring three heartline twists), the Mayan Mindbender indoor rollercoaster, and Dungeon Drop (a 20-story Intamin AG freefall tower). In 1998, AstroWorld opened a looping coaster designed by Anton Schwarzkopf. Originally a travelling coaster throughout Germany and other parts of Europe, the coaster known as Thriller was renamed Taz's Texas Tornado, and later simply referred to as Taz. This coaster installation brought the park's collection of Schwarzkopf rides up to three. Despite efforts to operate the coaster efficiently, it was removed at the end of the 2002 season and sent to Six Flags Marine World where its first drop and loop were modified by Premier Rides in an attempt to reduce the G-forces experienced by riders. The ride operated at that park under the name "Zonga" until it was closed and dismantled. It now will be used at a fair in Mexico. AstroWorld's last five years of existence began with the dismantling of the Astroneedle in the year 2000. The ride was stored in the park's boneyard until 2005. AstroWorld was the park to debut "SWAT", the prototype S&S Power 'Sky Swatter' ride. Swat was the world's tallest looping ride to give the sensation of being on a Fly Swatter. The ride was then moved to Six Flags New England as Catapult after AstroWorld was closed. On September 12, 2005, Six Flags CEO Kieran Burke announced that AstroWorld would be closed and demolished at the end of the 2005 season. The company cited issues such as the park's performance, and parking issues involving the Houston Texans football team, Reliant Stadium, and the Houston Livestock Show and Rodeo leveraged with the estimated value of the property upon which the park was located. The final date of the park's operation was October 30, 2005. After that, company executives were expecting to receive upwards of $150 million for the real estate, but ended up receiving less than half of that amount. After spending $20 million to demolish the park and clear the land, Six Flags received $77 million when the bare property was sold to Angel/McIver Interests, a Conroe, Texas based land development firm in 2006 (reported in a corporate earnings report). This transaction contributed to the decision by shareholders of the company to remove Burke from both his position as CEO as well as his seat on the board. He was replaced as CEO by former Disney and ESPN executive Mark Shapiro. Plans for the former site have not been determined. Local developers feel that the size and location along the 610 Loop near the Reliant Park complex and proximity to METRORail make it ideal for a dense urban type of development. The local soccer team the Houston Dynamo which was created shortly after the park closed, was interested in creating a soccer-specific stadium in the former park site, until moving on to East Houston. As of October 2015, ten years after the closing, the 104 acres (42 ha) of land that was Astroworld has been used as additional parking for the Reliant sporting complex across the street. Parking on the former site was not allowed for the 2012 NFL season for Texans games. The mixed use development "SouthPointe" has been proposed for the site. Allen Crosswell, a real estate developer from the firm Croswell Torian Commercial Properties, said that the former Astroworld site is "about 85 to 90 city blocks. So, it's a pretty big development." The site has also been host to music festivals, carnivals, and amateur sporting events. An 8-foot (2.4 m) by 10-foot (3.0 m) 1967 model of Astroworld is displayed at the Julia Ideson Building of the Houston Public Library Central Library. It was placed there in 2011. Batman: The Escape 1993 2005 Intamin Stand-Up Roller Coaster European Village Relocated to Darien Lake where it remained unassembled for several years before being scrapped. Greezed Lightnin' 1978 2005 Schwarzkopf Shuttle Loop Western Junction Relocated to Joyland Amusement Park, where it remains in storage in nearby McKenzie Park. Ownership transferred to Cliff's Amusement Park. 610 Limited 1968 2005 Train Water World/USA/Western Junction When the park closed, the sole steam locomotive at the time was sold to the Pacific Coast Railroad in Santa Margarita, California, where it now operates. However, several years before, presumably, the other steam locomotive was sold to a private collector in Durango, Colorado. The diesel went to Six Flags America and operates there. The steam outline locomotive "Elizabeth" (formerly from Opryland) went to Six Flags Over Georgia where it is currently stored. Alpine Sleighs 1968 1983 Arrow Development Dark Ride Alpine Valley Mountain Stood Abandoned For 10 Years, Reopened In 1994 As The Batcave. Diablo Falls 2003 2005 WhiteWater West Spinning Rapids Relocated to Six Flags New England as Splashwater Falls. Removed on September 5, 2016. SWAT 2003 2005 S&S Power Sky Swat Plaza de Fiesta Relocated to Six Flags New England as Catapult, and later scrapped in 2013. Tidal Wave 1988 2005 Arrow Dynamics Spillwater Plaza de Fiesta In storage at Great Escape. The 2008 video game Six Flags Fun Park features an area named "Astro City", with space-themed attractions. Rapper Travis Scott, born and raised in Houston, announced that his third studio album would be titled Astroworld, in homage of his hometown. In an XXL Magazine interview, Travis talked about when Astroworld was closed and demolished, saying "They took AstroWorld away from us in Houston". In that interview, one of Travis' friends said that "Someone said they took it away to make the rodeo bigger" which is, non-coincidentally, the title of his debut album, Rodeo. Astroworld was released on August 3, 2018. In the novel Jurassic Park, park engineer Ray Arnold thinks about all of his contributions to the technological world including Walt Disney World, Six Flags Magic Mountain, and Astroworld in Houston. ^ S., SEEBER, JILL (15 June 2010). "HOFHEINZ, ROY MARK". www.tshaonline.org. ^ Hlavaty, Craig (August 13, 2018). "Houston Livestock Show & Rodeo says AstroWorld land could eventually be redeveloped". Houston Chronicle. Hearst Communications. Retrieved March 30, 2019. ^ "Randall Duell Is Dead; Park Designer Was 89". The New York Times. 1992-12-04. Retrieved 2009-11-11. ^ "The City: The Disneyland Effect". Time. June 14, 1968. Retrieved May 23, 2010. ^ "Texas Cyclone - Six Flags AstroWorld (Houston, Texas, USA)". www.rcdb.com. ^ "Six Flags Theme Parks Cash-In on Halloween; Theme Park Company Uses Halloween ``Fright Fest to Drive Incremental Attendance, Revenues. - Free Online Library". www.thefreelibrary.com. ^ "Boo! AstroWorld Fright Fest scared Houston for a generation". 4 October 2018. ^ "Houston's AstroWorld theme park to close". September 12, 2005. ^ Dawson, Jennifer (May 11, 2006). "Local developer to acquire former Astroworld site". ^ a b "What's Next For Astroworld Lot? Archived 2010-07-21 at the Wayback Machine." KPRC-TV. Monday December 14, 2009. Updated December 15, 2009. Retrieved on January 7, 2010. ^ Turner, Allan. "Retouched Astroworld model getting a home at library." Houston Chronicle. Thursday July 7, 2011. Retrieved on September 15, 2011. ^ "Future of 610 Limited - Six Flags Astroworld is FOR SALE! - Page 4 - Disney Railroads Discussion Board". burnsland.com. ^ "Travis Scott Announces Third Album 'Astroworld'". ^ "Travis Scott Searches for Happiness While Creating His 'AstroWorld' Album - XXL". XXL Mag.